Gods & Heroes: Rome Rising developer Heatwave Interactive has pledged to donate $1000 to the AbleGamers Foundation if it gets 1000 "Likes" on Facebook. This is the easiest good thing you'll do all day. Go to the Gods & Heroes: Rome Rising Facebook page and give it a "like." The game gets a thousand likes, the AbleGamers Foundation gets a thousand bucks courtesy of Heatwave Interactive, the studio behind Rome Rising. It's a can't-lose deal; even if you've never heard of the game, all you have to do is click your mouse to do a solid for physically-challenged gamers. The AbleGamers Foundation, in case you've never heard of that, either, is a foundation created in 2002 "committed to supporting the advancement of accessibility in the digital entertainment space." The foundation conducts community and industry outreach programs with the goal of bringing mainstream gaming to as many players as possible and also runs AbleGamers.com, a site that provides gaming news, reviews and other content aimed at disabled gamers. And while you're at it, you might as well give the game a look too. 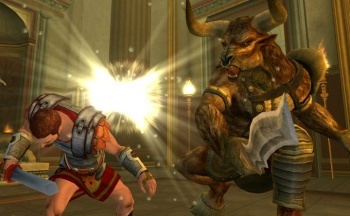 Gods & Heroes: Rome Rising is an "award-winning Roman mythology-themed MMO" that's been in development since 2004. Work on the game was halted in late 2008 but Heatwave acquired the rights to the game in February 2010, resumed development and now expects to have it ready to roll out sometime in 2011. So, bottom line: like something on Facebook, help out a good cause and maybe discover a cool game in the process. This should be the easiest thing we do all day; hell, the Escapist crew should be able to squeeze that grand out of Heatwave by itself in about ten minutes. So get to it!